Climate change activists from the Extinction Rebellion movement demonstrated again in London on Wednesday. Three protesters glued themselves to a train at Canary Wharf, including two who climbed onto the roof of a carriage. Police have arrested more than 300 people at a series of demonstrations and blockades across the city since Monday. We're concluding our live coverage for now; read our full report below. Climate change activists, including Labour party councillor in Stroud Skeena Rathor, pictured left, have glued their hands together and locked themselves to the fence outside the home of Britain's opposition Labour party leader Jeremy Corbyn on the third day of an environmental protest by the Extinction Rebellion group. Four climate change activists have attached themselves to a fence outside the north London home of Jeremy Corbyn, the UK opposition Labour party leader. The foursome, including Labour party councillor Skeena Rathor, pulled the stunt on the third day of environmental protests by the Extinction Rebellion group. According to Extinction Rebellion’s Facebook page, the activists are “locked on and glued to each other, in an attempt to talk to Jeremy in the face of a climate and ecological emergency." Rathor said in a Facebook live interview posted on the page: “I’m feeling sad, I love Jeremy, I always have done ever since the moment I rejoined the party... I feel really sad having to be here when I know he doesn’t want me to be here. 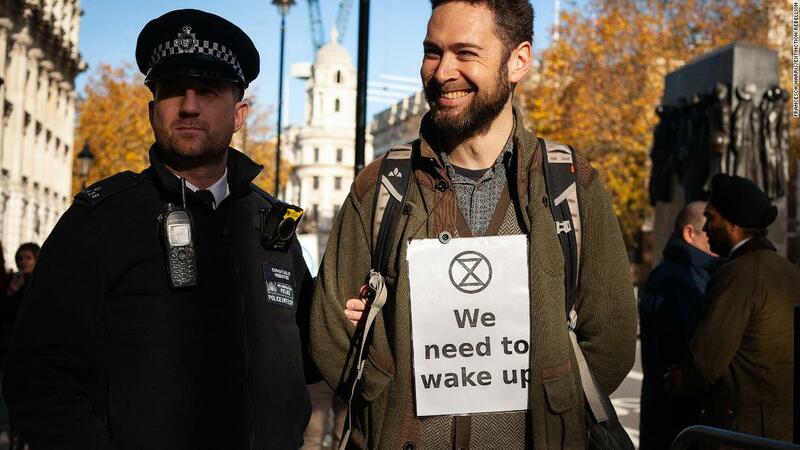 More than 300 protesters from the Extinction Rebellion movement have been arrested since they started demonstrating across London on Monday, the Metropolitan Police said in a statement on Wednesday morning. Authorities have banned demonstrations in some of the busy transport areas of the city targeted by the movement, including Waterloo Bridge and Oxford Circus, but protesters still remain. It's been something of an eventful third day of climate protests in London. Activists continue to hold Waterloo Bridge with both directions blocked off and a truck parked diagonally across one side. The demonstrators have created something of a street party atmosphere. Signs reading "The climate is changing, why aren't we?" and "People and planet vs. profit" line the makeshift camp where a vegetarian diner, second-hand book shop and sleeping area have been set up. Part of the truck has become an improvised concert stage where artists come and perform periodically. Elsewhere, a tent has been set up for mothers with young children. And for most of the day, the air has been filled with music, singing and conversation. Demonstrators take part in a yoga session on Waterloo Bridge in London on Wednesday. The grassroots movement lead by British organization Extinction Revolution has inspired an eclectic cross section of society with young and old out in the spring sunshine. Protesters Robin and Karen are on the bridge Wednesday because they want the government to take responsibility. Karen tells CNN that she's been an active environmentalist for several years but saw little action. "We have so little time left now that non-violent direct action [like the ongoing demonstration] is a reasonable course of action to take," she says. Protesters Robin and Karen at Waterloo Bridge on Wednesday. Shakana was another protester who attended the sit-in at Waterloo Bridge on Wednesday. Shakana, another protester, said that as a younger person she feels powerless, but wants to help bring about change. "As a youth, I don't have that much power in this world. I can't go to the local authorities simply because of my age -- they don't take me seriously. So I think my presence here is making an impact," she explains. Shakana said she's not worried about how the sit-in on Waterloo Bridge has impacted people getting around the city. If we don't take action now, climate change will make the greatest inconvenience to all our lives. This simple, small inconvenience is changing our lives for the better." UK wildlife expert: "People will listen and we will win"
UK wildlife expert and television presenter Chris Packham has joined hundreds of climate change protesters at Oxford Circus. "There is no doubt at all that we face all sorts of problems. But I stand here as an optimist, I stand here because I believe our species is resourceful, adaptable and intelligent and we can come up with the solutions if we don't already have them and we can implement them for positive change," Packham, 57, told the cheering crowds on a sunny Wednesday afternoon in the heart of London. "But we don't do that with short-term vision, we don't do that with short-term politics. We do that with long-term investment," he continued. "The key to our success is to remain peaceful and democratic, the key to our success is to continue to tell the truth and not get goaded into excitable mistruths," Packham said. "Ultimately people will listen and we will win," he concluded. Protesters on Waterloo Bridge on Wednesday. Climate activists are holding a third straight day of demonstrations in the UK capital. It's day three of the Extinction Rebellion (XR) climate protests in London. One of the sites environmental activists have targeted is Waterloo Bridge. On Monday, XR demonstrators stationed themselves on the bridge, bringing along tents, blankets and sleeping bags in the hope of staying for as long as possible. On Wednesday afternoon, CNN saw an increased police presence on the bridge before officers could be seen approaching the front line of protesters. In response, individuals among the XR demonstrators willing to be arrested for their cause -- known as "arrestibles" -- were moved forward. One protester, Yanai Postelnik, had been telling CNN about the advice he was offering to people in case they got arrested. Minutes later, he engaged in a brief conversation with police before he was carried away from the bridge. Protesters who are prepared to be arrested for taking a stand move forward on Waterloo Bridge as officers from London's Metropolitan Police approach. A demonstrator is forcibly removed from Waterloo Bridge after briefly talking to police officers on Wednesday. London Mayor Sadiq Khan says he is "extremely frustrated" by the climate protesters' decision to disrupt and damage London's public transport system. London has always been a city where protests are encouraged, Khan said in an interview with Sky News on Wednesday. "Only last year we celebrated the first women getting the right to vote, that came from women protesting 100 years ago. I was at a protest myself a few weeks ago, protesting, campaigning and lobbying for the British public to have a final say in whether we should stay in the European Union ... It's important though that any protest is peaceful and lawful." Speaking after activists glued themselves to a train in the busy financial area of Canary Wharf, Khan continued: "I'm extremely frustrated by the damages caused to the public transport system in London. That's why I'd say to the organizers: Please work with the police, please work with TFL [Transport For London], to make sure you minimize disruption caused to those trying to get about their business in our city." "That includes Londoners trying to get to work, but also others who work in London and do a huge amount to make sure our city is successful," Khan added. Demonstrators gather during a climate protest in Parliament Square in London on Monday. Environmental activists are holding a third consecutive day of climate protests in London on Wednesday. This round of demonstrations -- organized by a grassroots environmental group known as Extinction Rebellion (XR) -- are due to continue for two weeks. An "international movement that uses non-violent civil disobedience to achieve radical change in order to minimise the risk of human extinction and ecological collapse," according to its website. The group, which was founded by British activists, first rose to prominence last year when it caused disruption outside Buckingham Palace, Downing Street and brought London traffic to a standstill by blockading five bridges. The disruptions this week have seen activists target four sites: Marble Arch, Oxford Circus, Parliament Square and Waterloo Bridge. What is XR trying to achieve? The group has three aims: the first is to get governments to declare a "climate emergency," reduce net greenhouse gas emissions to zero by 2025, and for citizens' assemblies to lead the government on climate and ecological justice. Why do some of the activists want to be arrested? The group believes that significant numbers of people will have to get arrested and cause disruption for the government to pay attention to their demands. The Wi-Fi network at underground stations in London has been switched off in an effort to prevent climate change activists from coordinating their protests, Britain's Press Association reports. The group is part of an ongoing climate protest which organizers have said is taking place in at least 80 cities and more than 33 countries around the world. They are demanding that governments reduce carbon emissions to zero by 2025, and calling for the creation of citizens' assemblies to come up with an emergency plan of action on climate and ecological justice. On Wednesday morning, the group began what it described as a day of "light" disruption to London's overground network. "This action is called 'The Pause' -- our aim is to create moments in time when humanity stops and fully considers the extent of the harm we have done and are doing to life on earth," it said in a statement. All three protesters who had earlier glued themselves to a train at London's Canary Wharf station have now been removed by specialists from the British Transport Police and arrested. 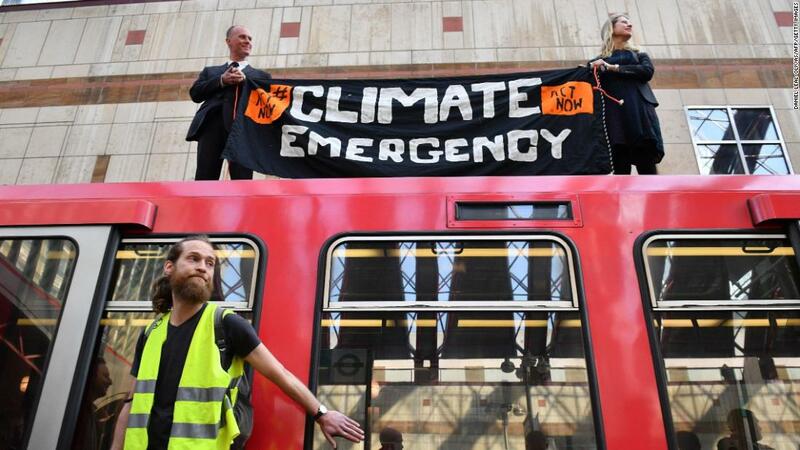 A man and a woman had climbed on top of the train and unfurled a banner reading "Climate Emergency." Each then glued one of their hands to the top of the train. A third man glued his hand to the side of the train, near one of the doors. Officials were seen climbing a ladder and addressing the two protesters on the roof of the carriage. They provided the pair with protective googles and helmets before applying a solution to the protesters' hands to remove the adhesive. The activists were then strapped into harnesses and lowered from the train roof to the platform below. Police remove a climate change protestor from the roof of a train at Canary wharf station on the third day of an environmental protest by the Extinction Rebellion group in London on Wednesday. The second climate change activist is lowered from the train roof.